Computational Fluid Dynamics (CFD) is a numerical tool for the simulation of complex phenomena like fluid flow, heat transfer, mass transfer, chemical reaction, etc. Values for all the simulated variables (temperature, flow, concentration, velocity, etc) can be obtained at any given point of the simulated domain. 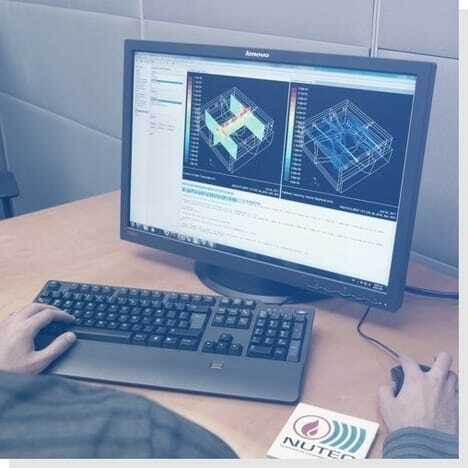 We use state of the art Computational Fluid Dynamics (CFD) software for process design and optimization and to identify potential improvement areas. Virtual Lab. What if scenarios can be easily tested without actual experimentation. Better undesrtanding of complex interaction between variables. Determining Product heat up time. Temperature uniformity in kilns and furnaces. Design and optimization of thermal incinerator for maximum oxidation of organics. Temperature uniformity in heat treating furnaces. Transient response to burner pulses.